I make this blackberry jam every Monday. It's incredibly quick, easy, fool-proof, and 100% delicious. I use it on ice cream, in greek yogurt, I steal a spoonful when I need a hit of something slightly sweet, and it's great on toast. It's also sugar free and full of fiber. I thaw my blackberries on the counter for an hour. It's 80 degrees in our house, so they thaw quickly. You can always thaw them overnight in the fridge, though. When they are ready, pour them and any juice into a medium saucepan. Mash them with a potato masher, fork, or pastry cutter. Leave some of the berries whole or partially whole. You are mashing them to make them juicy. I add 1/4 cup of Splenda, but it is not enough to make this jam sweet. It basically just takes away most of the tart. If you want sweet jam, add 1/3 - 1/2 cup Splenda. Pour over your blackberries. Then add the water. 1/4 cup no matter how much Splenda you add. Stir and then sprinkle the 2tsp of Pectin over the berries. Stir thoroughly. Turn the stove burner to medium and bring berries to a boil. Keep it boiling for one minute while stirring constantly. Remove from heat and cool. While it is still warm I like to spoon a little over some sugar-free ice cream. 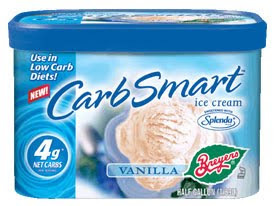 Breyers makes an incredible Splenda sweetened ice cream. Tastes like the real thing! When the jam is cool, pour it into a dish to store in the fridge. It's better if the jam is protected from air. At this point the jam will still be runny. Don't worry! It thickens up in the fridge. My favorite breakfast is greek yogurt with a tablespoon of my blackberry jam. Big yum!! How interesting! It never occurred to me that jam could be made without the canning process. I'm going to have to try this. I followed your link from your recipe for pumpkin muffins (fabulous, by the way) on Tasty Kitchen, and I've been enjoying your blog. Glad you are enjoying my blog and the pumpkin muffins! I love Tasty Kitchen. :) Definitely give the jam a try--it's so easy.